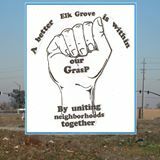 Elk Grove GRASP, a locally-based group advocating smart land planning, will hold their monthly meeting tomorrow night. The meeting will be held at the Elk Grove Library on the corner of Elk Grove Boulevard and Elk Grove-Florin Road is scheduled to start at 6:30. Among the topics the group will be discussing include the City of Elk Grove sphere of application to expand its boundaries, and the city's general plan update. Not necessary. All we need to know about smart planning is being directed by the developers. So far, they have done a great job designing our city. Elk Grove is one of the premier destination cities in the entire state.